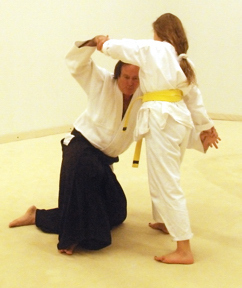 Our Chief Instructor has been teaching Aikido in the Houston and Galveston area since 1985. Our Dojo is afililiated with Hombu Dojo in Japan. Black Belts awarded here are registered in Japan with Hombu Dojo and are recognized world wide. Aikido is a defensive, non-aggressive martial art that teaches how to use, rather than oppose, the force of an attacker to take them off balance and take control of the situation. While it was founded in the 20th century by Master Morihei Ueshiba at Hombu Dojo in Japan, its roots trace back to the fighting arts of the Samurai. The ethical goal of Aikido is to take control of an attack situation without the need for causing injury. However, very minor variations of the techniques can make them very deadly. 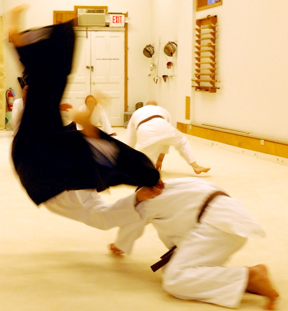 Aikido teaches how to meet attacks with relaxed, deliberate, effective response. The principles of motion, balance, timing and extension are taught through a variety of exercises and by working with a partner. 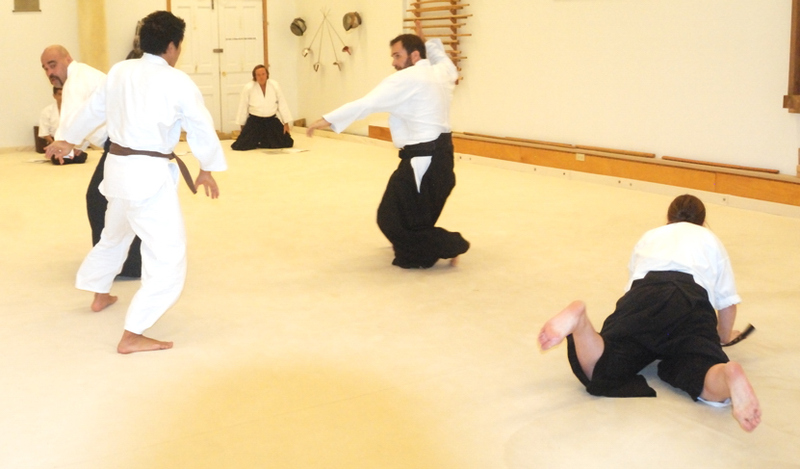 In a larger sense, Aikido teaches one how to meet stress with calm. When one becomes accustomed to meeting a physical attack with a calm response, it is very easy to meet the attacks of our workplace or relationships calmly. The student of Aikido soon discovers ways to apply it's principles to the non-physical assaults of everyday life. 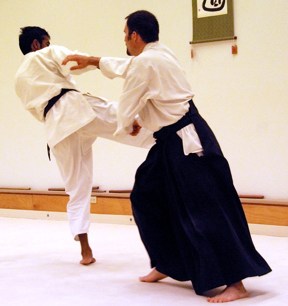 The basic principle of all Aikido techniques involves using the very force of an attack to take control of the situation. When done properly, very little muscular strength is required to perform the techniques. As shown in these photos, even a child or a small woman can easily throw a large man when the technique is done properly. Hence, Aikido is an ideal martial arts for people of all sizes, both sexes and a very wide range of ages. 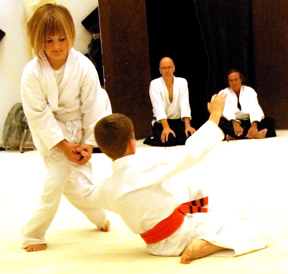 Children can usually begin Aikido classes at about age 7, depending on the maturity if the child. Somewhere around age 13, they are moved into the adult class. Aikido is primarily a throwing martial art. Early training focuses on learning how to fall safely and painlessly, as well as building on co-ordination and concentration. However, a special program is available for those who are unable to fall safely either due to advanced age or medical condition. Our oldest student to date was age 82. In this special program only the defensive part of the training is learned and no falling is required. 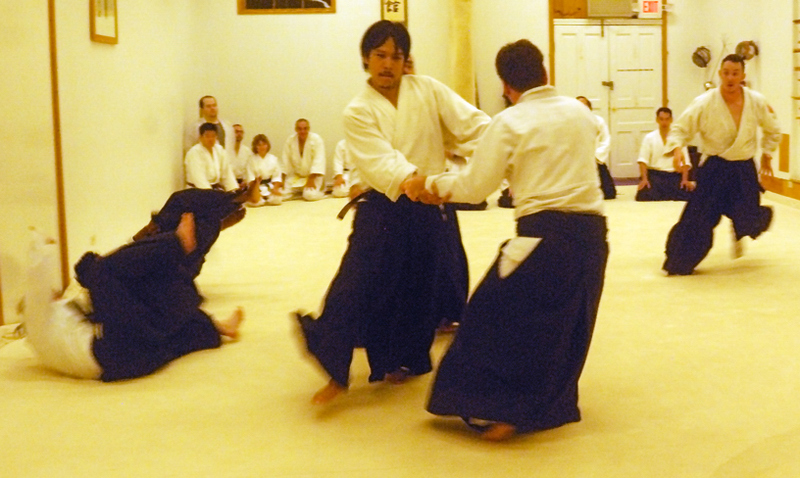 As Aikido training progresses, a variety of throws, wrist techniques, pins, weapons techniques and defense against multi-person attacks are taught. 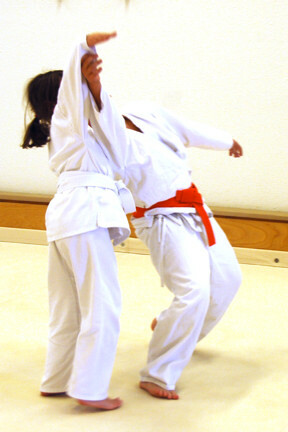 Initially, the techniques are taught against grabbing attacks. This is highly practical, since many attacks against women start with a grab. After the techniques can be successfully used against grabs, the attacks are escalated to included chops, punches, kicks and weapons attacks. The classical weapons of the Japanese Samurai (knife, wooden staff, and sword) are taught as part of Aikido. See our webpage on Weapons for a more complete description. Defense against attack of multiple attackers is taught at the Brown and Black Belt level. The Japanese term for this is "Randori" which translates as "seizing chaos". In this style of Aikido, multiple attackers attack simultaneously. The idea is for the defender to position themselves so that the attackers cannot reach them simultaneously so that the attacks evolve into a series of individual combats. Doing this requires considerable practice. The training is very structured. After one attacker can be dealt with then the defender is taught to deal with two attackers. After two attackers can be dealt with, then a third attacker is introduced. Eventually in a large dojo, 6 attackers are dealt with. 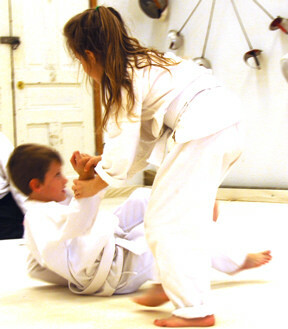 The limitation on number of attackers eventually becomes the size of the dojo so participants have room to fall safely. The action is so fast and furious that the conscious mind cannot plan what to do. The goal is to develop the ability to just let the unconscious mind take over and move in response to the attacker's movement. By eliminating the evaluation and considerations of the conscious mind, much faster movement is possible. In making the Star Wars movies, George Lucas brought these concepts to the movies. As in all traditional martial arts, there are no contests in Aikido. Each student practices with a partner to achieve their own level of mastery. 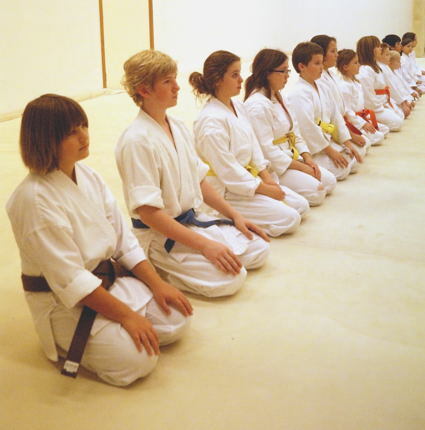 Children's Aikido Classes are taught on a separate mat area.